In 1931, the McKean home was purchased by Mr. and Mrs. Munn, and converted into a hotel. It was under Munn's ownership that the house was first christened "The Colonial". Under the ownership of Munn, an addition was added to the side of the house. Munn sold the house to Ernest J. Monsch in 1941. Over the next 45 years, the hotel changed owners numerous times. Smethport is to have one of the finest hotels in this section of Pennsylvania, thanks to the initiative of L. E. Munn, popular proprietor of Munn’s Hotel, Main Street. By a deal concluded last Friday, Mr. Munn purchased the large McKean mansion at the corner of Main and Mechanic Streets from the estate of the late Kathe rine McKean. He has already started to remodel the structure into a modern hotel, which will be open to the public in May. The purchase involved a large figure, unannounced, and included the large three-story colonial-style mansion, real estate and the magnificent furnishings, including beautiful period furniture, rare tapestries, oriental rugs, costly paintings, beautiful silver and china services and one of the finest libraries in McKean county, containing rare volumes and deluxe editions. Despite the large amount of paid by the purchaser, the buy is considered by experts to be a bargain. The large three-story mansion of beautiful colonial design and regarded as one of the most pretentious in McKean county, was erected by the late Charles McKean in 1905, at a cost of upwards of $50,000 at a time when material costs were extremely low. The furnishing of the home, displaying the discriminating taste of the late Mrs. McKean, is reputed to cost an additional $50,000. Mr. Munn intends to dispose of the furnishings, including the art objects and library, at private sale and is already being deluged by inquiries from collectors who desire to purchase. Mr. Munn has engaged Alfred Johnson, local contractor, to remodel the mansion for hotel purposed and a crew of men started work on the job Monday. The first floor will be finished off to include a large rotunda and office, a large dining room, a private dining room and kitchen. The second and third floors will be finished off into fifteen modernly appointed sleeping rooms—the majority with baths and all the running water. An elevator will also be installed. Mr. Munn will strive to make the cusine of the new hotel noted for its super-excellence and those who are familiar with the fare he has always provided at his present hotel know that he will succeed. He will continue to operate his present brick hotel and restaurant which is located across the street from his new hotel and which has and is enjoying a large patronage. It is expected that the new hotel will be opened to the public on about May 1st. Lawrence Munn, in acting to provide Smethport with this modern hotel, has rendered the community one of the greatest services it has received in years. Nothing advertises a town more than a first-class hotel and Smethport, possessing beauties which attract much admiration from tourists over the great Roosevelt Highway, has acutely felt the need of a hotel to augment the splendid local tourists’ homes and to appeal to that class of travelers who seek hotel accommodations, for three years past. Mr. Munn shows an optimistic outlook on Smethport’s future in providing the town with a hotel which is bound to become known far and wide under his capable management. Smethport’s magnificent new hotel, which will be owned and operated by L. E. Munn, will be opened to the public next Monday. 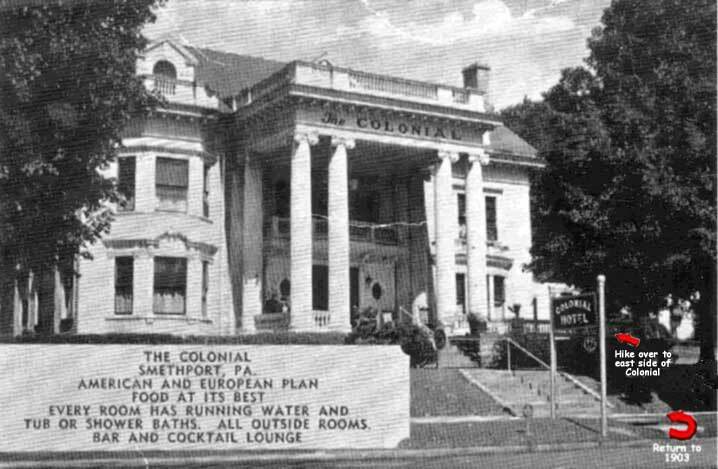 The new hostelry will be known as the Colonial Hotel and due to the magnificence of its appointments and excellence of cuisine is bound to advertise itself and Smethport over a wide area. Since Mr. Munn purchased the 3-story colonial mansion of the late Chas. McKean, pioneer Smethport lumberman, on Main street two months ago, work of converting the huge structure into a modern hotel has progressed steadily under the efforts of a large crew of carpenters, decorators and artisans. When the Colonial Hotel opens Monday, fifteen modern sleeping rooms, mostly with bath and all with running water, will be available for quests. Several of the rooms are unusually magnificent in appointments. The sleeping rooms are all modernly furnished, while the beautiful period furniture and splendid art collection of the McKean home have been used in the furnishing of the rotunda, lounge, dining rooms and spacious halls. The hotel contains a large public dining room and a private dining room with seating capacity for sixty able the hostelry to serve over 100 diners when occasion demands. The commodious kitchen has been equipped with the finest ranges and culinary equipment. Mr. Munn has engaged Mrs. Mabel M. Gallup as hostess of the new hotel. Mrs. Gallup has had extensive experience in this field of endeavor, having previously been hostess of hotels at Winona Lake, Ind., and in Miami and St. Petersburg, Fla. She will have complete charge of the dining room and culinary department of the Colonial Hotel. Courtesy and smart, attentive service will be aims of the new hotel, which is bound to be a wonderful asset to Smethport. The Colonial Hotel will not be excelled on the entire route of the Roosevelt Highway, which passes its front portal. The spacious grounds and curb lines of the hotel will afford convenient parking space for many automobiles. Converted from one of the finest and largest of private dwellings ever erected in this section of Pennsylvania, the Colonial Hotel in Smethport is acknowledged by those who express pretence as one of the leading hostelries along the thousands of miles of U.S. Route 6. Owned and operated by Mr. and Mrs. E.J. Monsch who purchased the hotel from the late Mr. Munn. In October 1941. The Colonial has progressed with the times. The numerous patrons of the Colonial benefit from the years of experience compiled by Mr. Monsch in this country and in his native Switzerland. Mr. Monsch was born in Switzerland, on June 6, 1896. He received his training in the hotel business in the Union Heivella in Lucerne and after coming to the United States in 1921 he studied at the Lewis Hotel Training School in Washington D.C. His professional experience in the business included service with several of the leading hotels of Switzerland, England and Italy from 1913 until 1920. After coming to this country he held leading positions in several of the better country clubs in the East and for several years was the purchasing agent of the Hotel New Yorker. For seven years he served as beverage manager of the Hotel Gotham in New York. All of this diversifying experience accumulated in the better hotels of the world has given the Colonial an enviable position among hotel owners and operators. Not only is this reflected in the Hotel proper, but in the dining room as well. The Colonial dining room is noted for the tasty and delicious food served to a discriminating clientele. The cocktail bar and lounge is fast becoming the meeting place of those who desire to drink their beverages in moderation. Located on the East side of the hotel, the bar and lounge is under the supervision of genial Carl Anderson. Here one may relax in a friendly atmosphere and enjoy a drink, expertly prepared. The Colonial was built by the late Charles McKean, as a private mansion in 1905 at a cost of $50,000. At that time materials and costs were but a small fraction of what they are today. It was reported that Mr. and Mrs. McKean spent an additional $50,000 in furnishing their home. 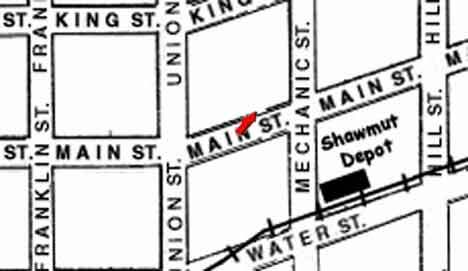 After the death of Mrs. McKean, Mr. Munn bought the property in 1931. Although Mr. Munn disposed of part of the furnishings and art objects in the McKean collection, many of the pieces are in use or on display at the Hotel today.